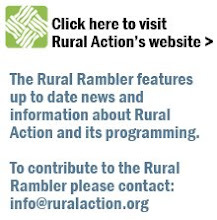 The Rural Rambler: Biofuels Workshop Coming in October - Enter the Corridor! Biofuels Workshop Coming in October - Enter the Corridor! Rural Action and our partners, Clean Fuels Ohio and the Hocking College Energy Institute, are conducting a biodiesel workshop on October 23rd. The workshop is part of the effort to establish the U.S. Rt. 33 Biofuels Corridor which will promote the use of biodiesel, a renewable resource. Topics covered by the workshop will be the technology itself; from the soybean field to the fuel tank, as well as the grants available from the state of Ohio to promote its use. The keynote speaker for this event will be State Senator Bob Gibbs, Vice Chair of the State Agriculture Committee. A special track of the workshop will be a briefing for policy makers. Conducted by Sam Spofforth, Executive Director of Clean Fuels Ohio, it will cover biodiesel and other alternative vehicle fuels. Policy makers from the area will be invited to this session. The workshop will be held October 23rd. from 9:00a.m. until noon and a barbecue lunch is provided. Contact Ava Mowery at 740.380.9315 or mowery_a@hocking.edu for reservations. Tuition is $30. For more information about the workshop as well as the Route 33 Corridor you can also check out this excellent article appearing this month in Biodiesel Magazine.